Students Hannah Lovvorn, Carmen Brothers & Rebekah Beasley accept the award from national president, Carolyn Hof Carpenter. 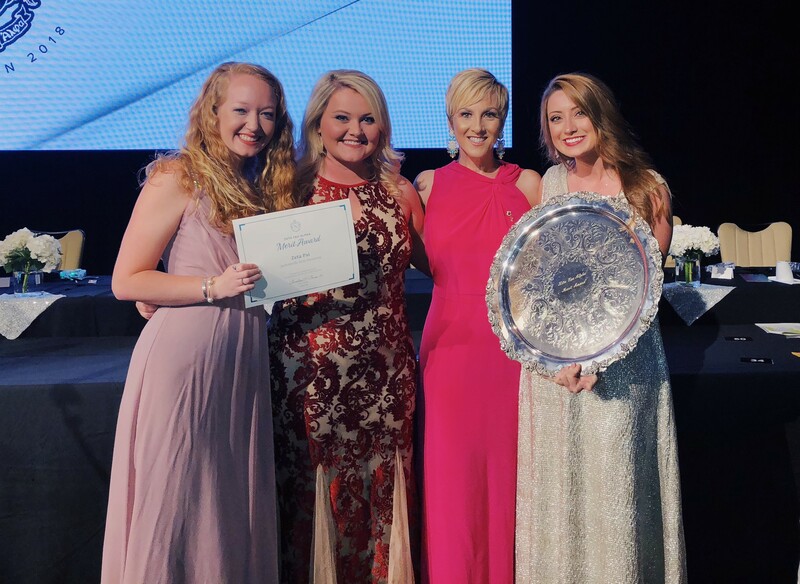 JSU’s chapter of Zeta Tau Alpha sorority has been recognized as the No. 3 program in the nation, out of 254 chapters, as a recipient of The Merit Award at the National ZTA Convention in Orlando earlier this month. Since 1948, The Merit Award has been given to a chapter in recognition of its outstanding and sustained achievement and leadership over the previous two years. The award is bestowed on the chapter that has maintained and sustained excellent officer and campus leadership, academic achievement, chapter attitude and cooperation. The chapter is advised by Dr. Andrea Porter, who became director of JSU Graduate Studies earlier this year after serving many years as an English professor. Zeta Tau Alpha was founded at Longwood University in Virginia in 1898, and is now second largest among the 26 national Panhellenic sororities, with 254 collegiate ZTA chapters, 238 ZTA alumnae organizations, and over 257,000 members worldwide. The Zeta Psi chapter at JSU was chartered in 1969. This past year, ZTA at JSU was awarded the President’s Gold Cup and was recognized for the highest sorority GPA. Zeta Tau Alpha will participate in JSU’s Panhellenic Recruitment of new members August 16-19, 2018, and encourages all unaffiliated women to register for Formal Recruitment. For more information about ZTA at JSU, visit jsu.zetataualpha.org, follow @ZTAJSU on Instagram and Twitter, and “like” Zeta Tau Alpha at Jacksonville State on Facebook.